Chunky Yarns are perfect for quick knits that will be extra cosy for when it's cold out. 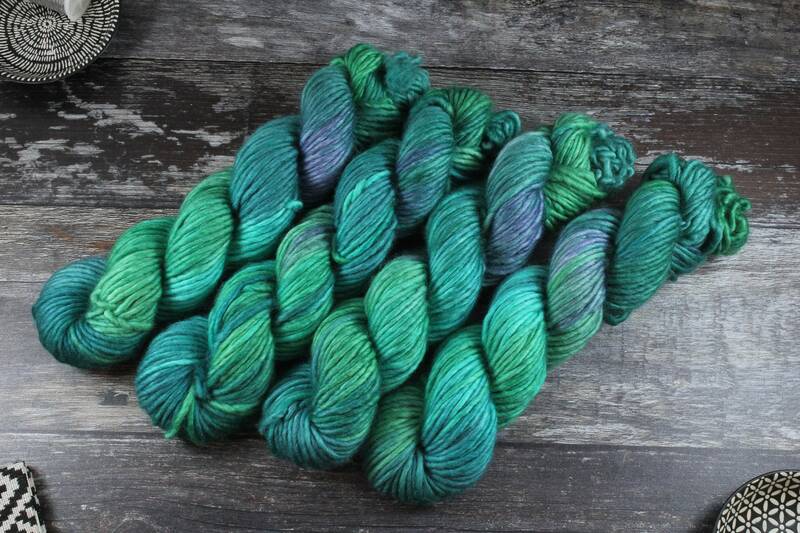 These are 100g skeins made up of a single ply of 80% superwash merino wool and 20% nylon. This yarn is gorgeously soft and silky to the touch and will be perfect for a quick knit hat or other cosy accessory. Please note that the price is per individual skein. Each colourway has been dyed up in a batch of four so if you would like more than one skein for a bigger project, snap them up when you see them as I won't be able to do a decent repeat. That's half the fun of hand dyed yarn anyway, each time they are always different and a little unique, even in the same dye batches. Whilst this is superwash merino, meaning that it won't felt up and destroy your soul should this end up in the wash, I would stick to a cool wash to preserve the colours. Fancy some dyed up yarn but you haven't quite found what you're looking for? Hit me up, I do custom orders too.